Amadou Diagne is a musician who has the traditions of West Africa at his fingertips. He is a multi instrumentalist, singer and songwriter who plays guitar, kora, percussion and kit drums. Born in Dakar, Senegal, Amadou comes from a long Griot family line of percussionists and praise singers. As a child he learnt to play sabar and djembe and performed at parties and social events in the local area. In his early twenties, Amadou’s talent led to him being invited to join l’Orchestre National du Senegal as a full-time member. This gave him the opportunity to further develop his musical skills with the highly disciplined daily practice that was required of each musician. It also opened doors for him to perform with some of the top West African stars at concerts and on television. At the same time, Amadou became a busy session musician on the vibrant Dakar music scene. Since moving to the UK in 2008, Amadou has been busy writing and recording his own music. He has developed a unique and intricate guitar style which draws heavily on his skills as a percussionist, exploring the instrument he is playing and delighting in the rhythmic possibilities within the melodies. 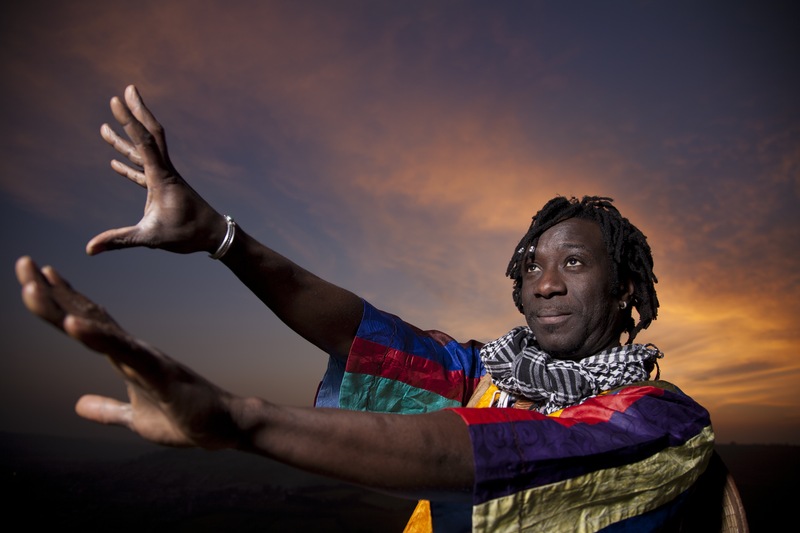 in 2015, Amadou played with Group Yakar at the opening of The Africa Eye festival in Bristol and Shambala Festival and as solo or duo with more traditional sets at the Sidmouth Folk Festival (Bulverton Marque main stage) and the Shrewsbury Folk Festival (Village Stage). In previous years he played at Purbeck Folk Festival (Main Stage), Exeter Respect Festival, Golowan Festival in Cornwall, Tropical Pressure Festival, Wadebridge Folk Festival main stage, Bath Folk Festival, LIFEM Festiva at King’s Place, Richmix, Passing Clouds, Jazz Cafe (support) and the rural touring circuit,. Amadou has had four star album reviews in FT.com for Ligéey and Songlines magazine for Yakar. He has twice had tracks from his albums included in the fRroots magazine top choices compilation download. Amadou has also been featured in the Rough Guide to African Blues. Amadou Diagne and Group Yakar are very active on social media and are swiftly building a loyal global fanbase. They are developing creative collaborations with visual artists such as David Cox who provided the artwork for the album Ligéey. They are also working with dancers to help channel the rhythms and impulses that emanate from their music into a colourful and expressive performance that gives audiences an uplifting and truly immersive experience.